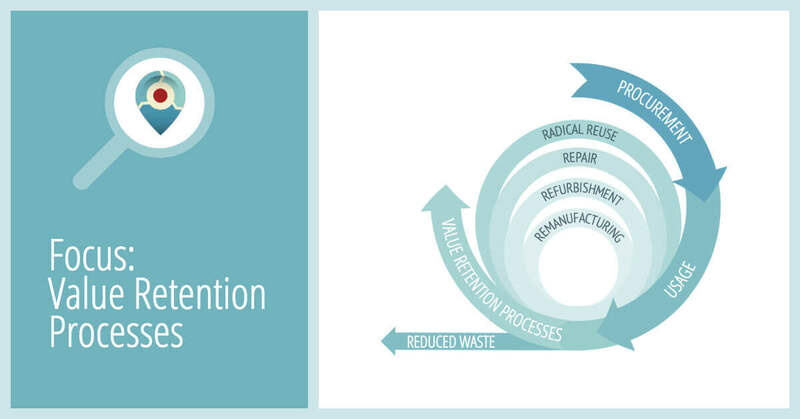 Value-Retention Processes (VRPs) namely remanufacturing, (comprehensive) refurbishment, repair and direct reuse and recycling are complementary processes that, if pursued strategically, can enable faster achievement of circular economy. 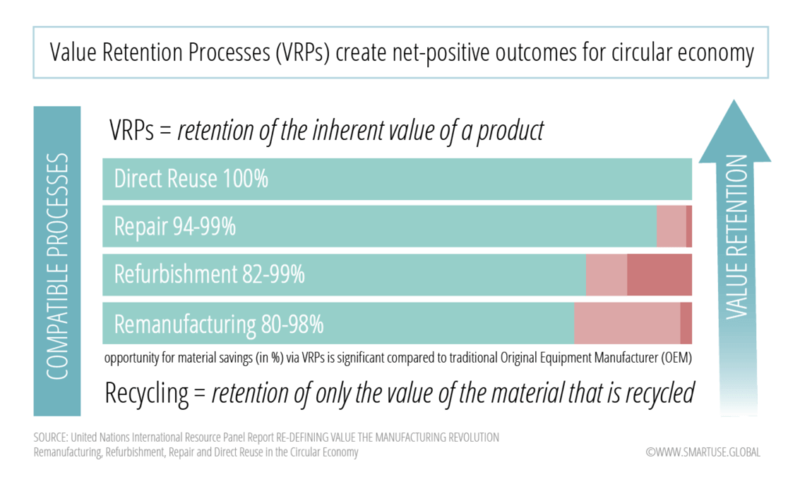 While most actors in the manufacturing supply chain are currently focused on recycling their products, the adoption of VRPs can lead to the retention of substantially greater value in the system. VRPs enable the retention of the inherent value of the product, whereas recycling retains just the value of the material or resource that is recycled. 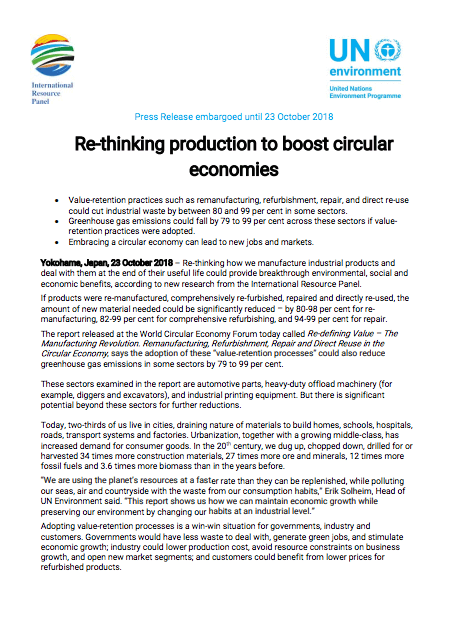 Re-thinking how we manufacture industrial products and deal with them at the end of their useful life could provide breakthrough environmental, social and economic benefits, according to new research from the International Resource Panel If products were re-manufactured, comprehensively re-furbished, repaired and directly re-used, the amount of new material needed could be significantly reduced – by 80-98 per cent for remanufacturing, 82-99 per cent for comprehensive refurbishing, and 94-99 per cent for repair. 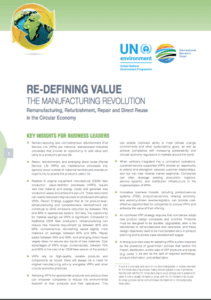 The report released at the World Circular Economy Forum called Re-defining Value – The Manufacturing Revolution. 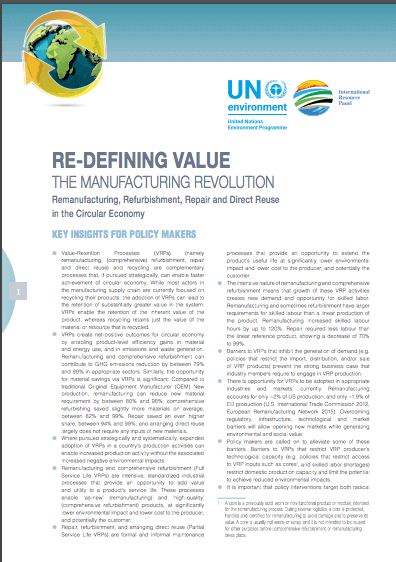 Remanufacturing, Refurbishment, Repair and Direct Reuse in the Circular Economy, says the adoption of these “value-retention processes” could also reduce greenhouse gas emissions in some sectors by 79 to 99 per cent. Adopting value-retention processes is a win-win situation for governments, industry and customers. Governments would have less waste to deal with, generate green jobs, and stimulate economic growth; industry could lower production cost, avoid resource constraints on business growth, and open new market segments; and customers could benefit from lower prices for refurbished products. 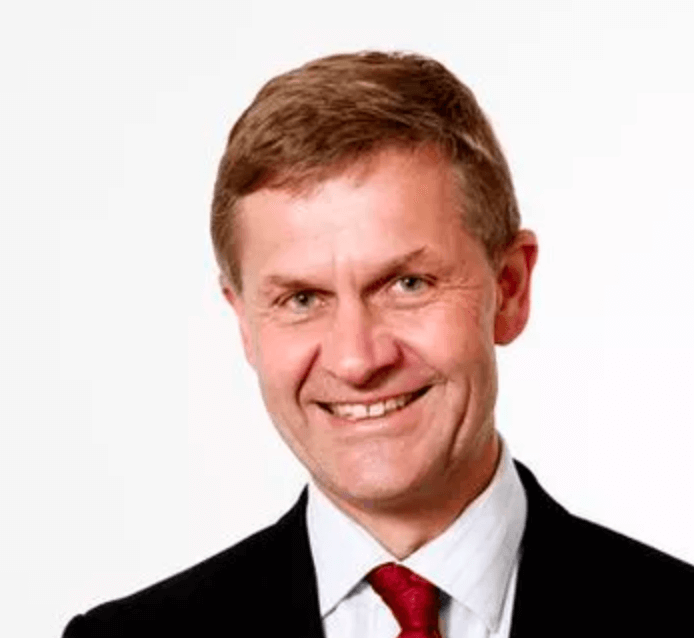 Currently, re-manufacturing accounts for only 2 per cent of production in the United States, and 1.9 per cent in Europe, leaving ample opportunity to develop these markets. 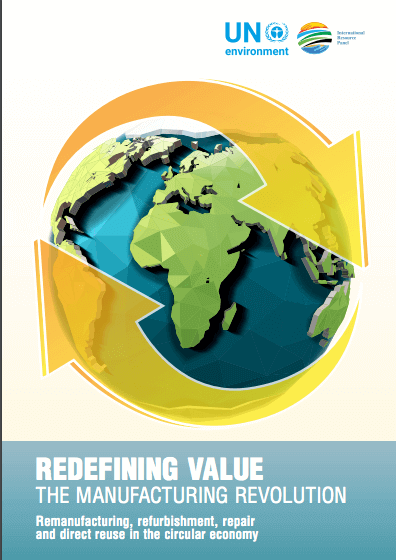 While there is no one-size-fits-all approach, where pursued strategically and systematically, adoption of value-retention processes can accelerate a country’s move to a circular economy – increasing production, without increasing the negative environmental impacts. 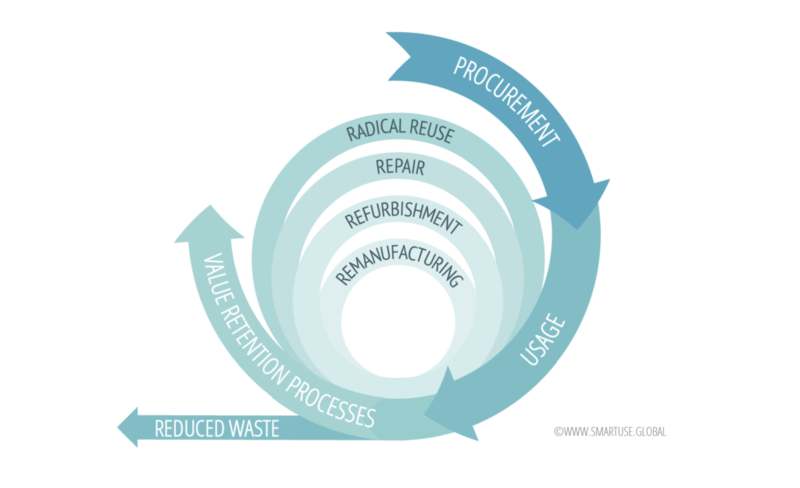 At SmartUse.Global, we and our partners provide the insight and the technology that can support Radical Reuse. Enabling innovative new business models such as Product-as-a-Service, the development of new networks and clusters for collaborations within or across sectors and more. 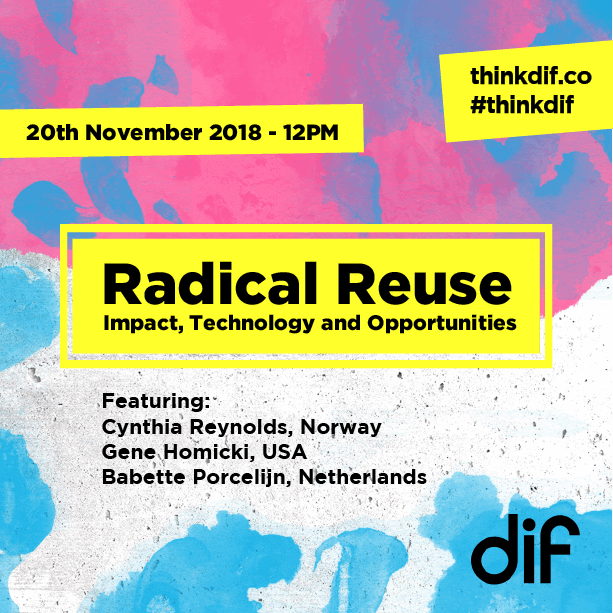 Join our Founder Cynthia Reynolds along side Gene Homick Founder and CEO of myTurn.com pbc and Babette Porcelijn Author of ‘The Hidden Impact’ where they will discuss “Radical Reuse – Impact, Technology and Opportunities” at the Disruptive Innovation Festival curated by the Ellen MacArthur Foundation on November 20th, 2018 at 12:00 GMT. The event will be recorded and available for later watching. 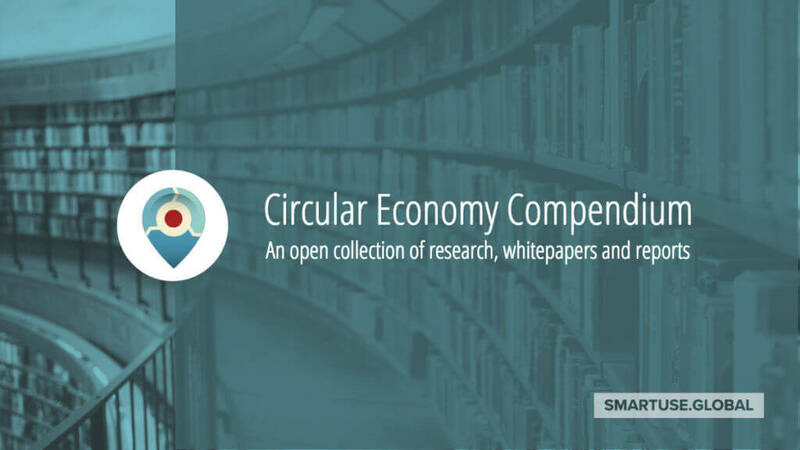 To read the full United Nations International Resource Panels report, you can find it as well as Factsheets for Policy Makers and Industry Leaders in the Circular Economy Compendium.